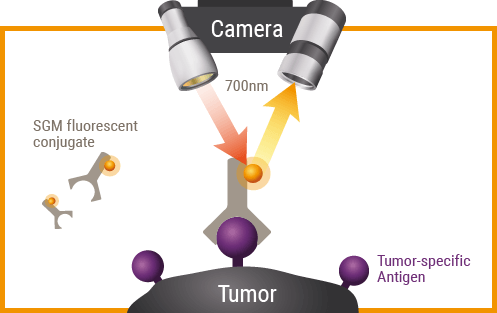 SurgiMAb’s innovative fluorescent conjugates allow surgeons to get a clear-cut image of tumors in real-time so that they can perform more radical surgery. Intraoperative fluorescence guidance will help decrease both under- and over-treatment by providing oncologic surgeons with a clear delineation of tumors within a healthy environment. SurgiMab molecule specifically targets digestive and breast tumors. Surgical navigation then allows tumors to be displayed in real time intra-operatively, allowing complete tumor resection while preserving important structures. Intraoperative tumor imaging with SGM targeted molecules represents a real-time improvement in the intraoperative differentiation between normal and cancer tissue. It will participate in the new paradigm-shift in cancer surgery: surgeons will improve patient outcome while lowering health-care costs. Our technology is based on tumor-specific antibodies conjugated to a near-infra-red dye. This injectable fluorescent dye has been optimized for the fluorescent image-guided surgery of small-size tumor nodules. After injection, the conjugated fix to the tumor surface markers. The fluorescent dye then act as a revelator, allowing visualization of micro-tumors and the radical tumor resection by the surgeon.